Anyone attend the annual meeting in Phx?Â What did you think of the Medcomp booth? ?Â The one that was hiding behind white curtains....weird huh? By the way, any insight on the "new" navigator. I know the Sherlock is preatty cool and probably much more precise, but I don't like the idea of BARD EVERTHING. 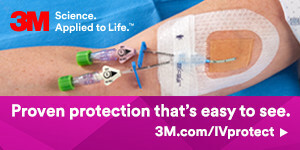 And you can't buy the Sherlock wires to use with any catheter. We use Vaxcell for saline only HIT pts. We wouldn't be able to use sherlock in that case. ect. The navagator wire can go with any PICC. The "new Navigator" is still being worked on. There have been a couple of people to use the demo models, and there were some improvements to be made. Viasys wants a better device when it comes out, not one that will give people problems. The Navigator stylet will fit into any and all PICC's as of this year. Viasys will be releasing a new wire in a couple of months that is a .8 in size. It will fit in just about anything. The new Nav will be lighter to handle, and the arrow will stay on longer when the tip is picked up. There will also be an improvement in the sound frequency. We also use a Boston Sci Vaxcel PASV. We are VERY happy with it, and would never use a tip locator that locked you into one particular picc, so I understand your concern on that issue.